As I move from teaching fourth grade to teaching sixth grade, I've noticed a great deal of overlap between the two curriculums*. This is not necessarily a bad thing, as so many of the big concepts are really important. However, knowing what kids learned in fourth grade is leading me to try to delve more deeply in sixth. 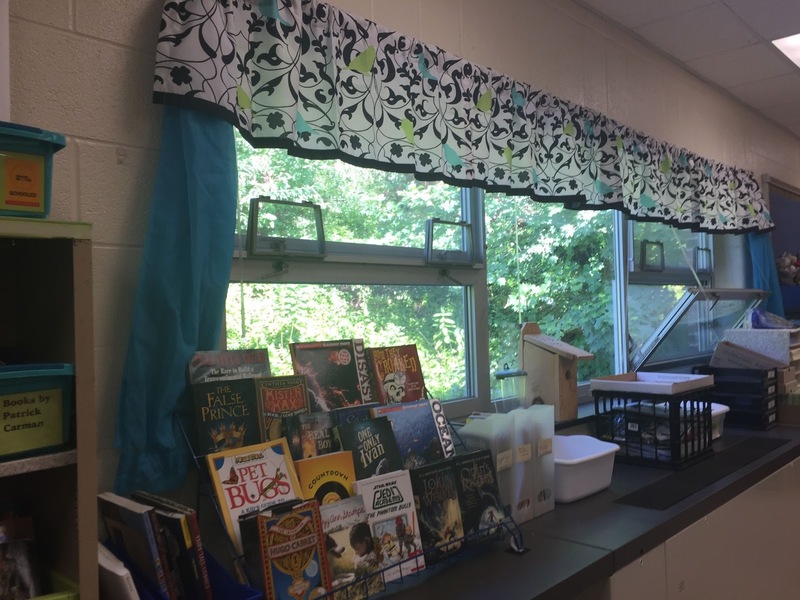 In the first few weeks of school, I reorganized an existing activity to add more depth. Originally, the activity was a standard water cycle model. You can see them in the photo to the right. The original activity had students identify the evaporation and condensation going on in the model. How could I ratchet up the thinking in this activity? I decided to explore the word model. What is a model in science, and what is the role of a model? Both our PA standards and the NGSS place an emphasis on the creation and analysis of models in science class. However, not many traditional curricular materials for elementary school engage students in exploring the worth of a model. Is this a useful model of the water cycle? Why or why not? Students referred back to the water cycle diagrams that we had made together and worked in groups to discuss. It was beautiful to observe! Best of all, there was wide disagreement. Most of the disagreement had to do with the way that we set up the models on the windowsill--the models that were closer to the window had much more condensation that the windows that did not. Some other models had been bumped and had blue water droplets clinging to the sides. "When it evaporates, it should be clear, right?" one student asked. "So why is it blue?" This led to a discussion of a model that is so fragile that a slight bump can change the results. 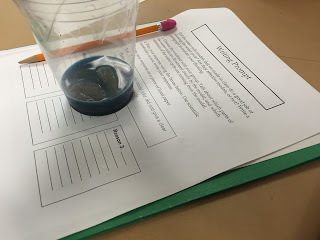 "If someone who didn't know about evaporation looked at it, they might think that the water evaporated blue!" a student said. The task also required students to refer back to their resources about the water cycle. "Would there be transpiration in this model?" one student asked her group. "There wouldn't, right? Because there are no plants." In another group, peers corrected a student's misconception about groundwater. 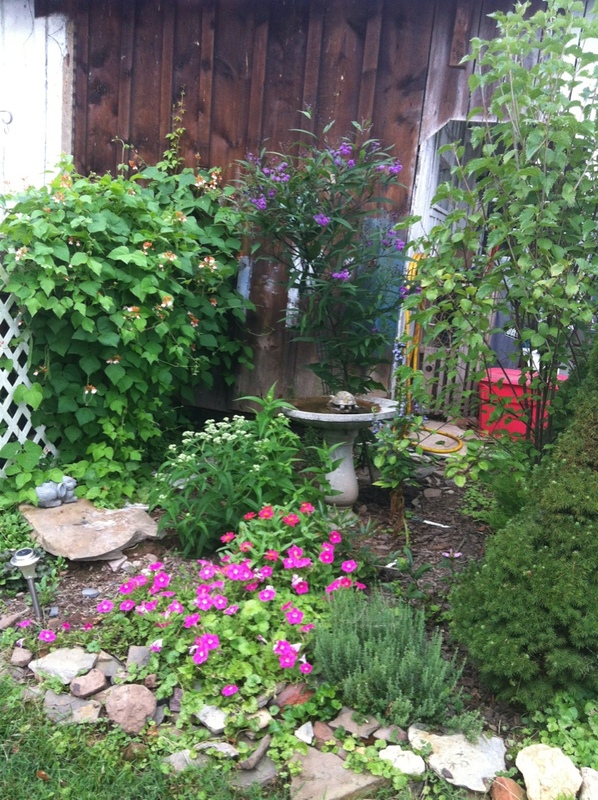 "The water on the bottom is the groundwater because it's on the ground," she said. Group members went back to the diagram to talk about why they thought the water represented surface water instead. 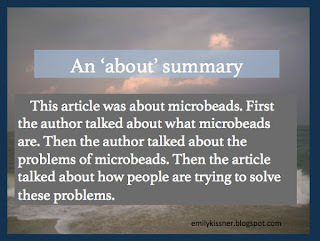 The writing prompt was a straightforward introduction to science argumentation, as I provided students with a claim that they could use as their topic sentence. Some students wanted to write more than a paragraph, while others stuck with a simple explanation. This will give me great information about where they are with science writing so that I can plan instruction from this point. For a busy teacher, re-making existing activities to involve deeper levels of thinking is a great way to build from an existing curriculum. What activities have you improved upon? You can find the writing prompt and activity in Watersheds, Wetlands, and Water Resources: Texts and Activities over at TpT. *I like "curriculums" instead of "curricula" because I think it's fussy to apply Latin-based rules to modern words. It's an acceptable plural here. In the early weeks of the school year, I admit to loving the computer lab. Not only is it equipped with great Macbooks for student use, but it is also air-conditioned! The cool air is a welcome respite from the heat and humidity of August and September. Last week, I experimented with flipping a lesson. Instead of me standing up and teaching all students at once, I wanted to give them the flexibility to move through a lesson at their own pace. While they worked in the cool comfort of the computer lab, I could work one-on-one with students to complete our beginning of the year assessments. Frolyc is the perfect tool for creating a flipped lesson. 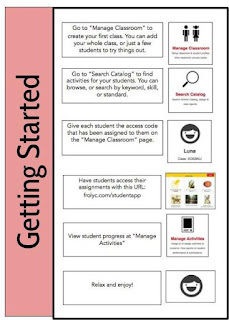 I can put all of the text, videos, and activities that I want students to use in one easy place. Even though my students don't all have computers at home, they still need to learn how to work through online content and learn from these kinds of lessons. I started out by creating my classrooms. No need for student e-mail addresses or lengthy forms--I just had to type in student first names. 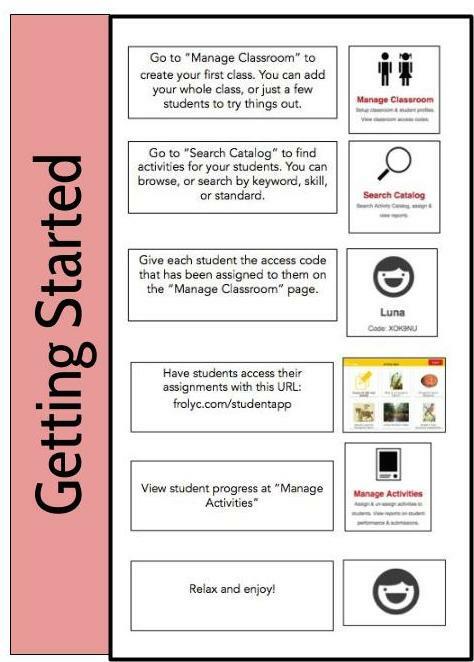 Each student receives an individual code that they use to access their activities. The kids found it very amusing to listen to me! Even better, though, they had full control of stopping and starting the video. "Can we watch it again? I don't really remember all of the words," one student said. "Of course!" I replied. This is one advantage of a video! After the video, students read a story, and then answered sequencing and multiple choice questions. These questions required students to apply the vocabulary that they had learned in previous pages. Some kids realized that they had to go back and reread, which was a great lesson for them. The lesson ended with a drawing activity. Kids enjoyed interacting with the drawing tool, and I loved watching the collaboration bloom--"How do you add a text box?" --and "How do I draw instead of erasing?" 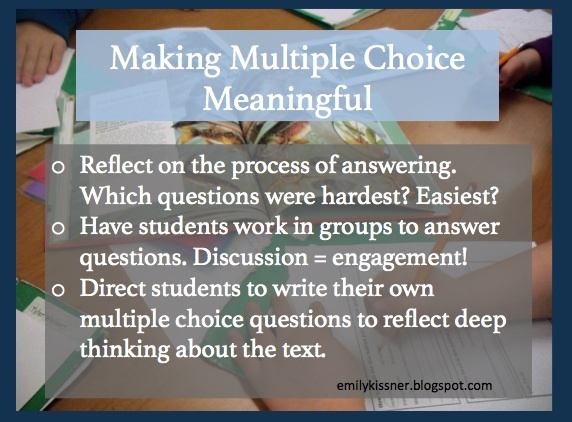 I'm planning to continue creating flipped lessons for students in the weeks to come. These lessons are great for introducing vocabulary and helping students to experience content. You can find the full activity here if you would like to try it out with your students. 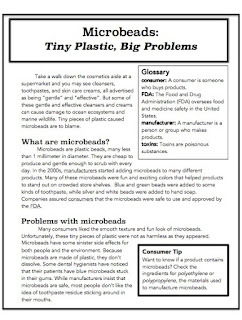 If you would like to try to create your own flipped lesson, here is a story that you can use--for free! 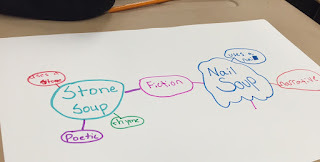 This retelling of "Stone Soup", told from multiple points of view, can be used for teaching about theme and point of view. I love teaching sixth grade! It is so wonderful to have the same students that I taught in fourth. The first few days of school had a totally different feel--I knew the kids, they knew me, so we could get to the fun stuff really fast. Science has been especially fun. I wanted to get right into the learning. The more years I teach, the more frustrated I am by "Preparing for Science" units. I feel like we spend time naming the tools that we could spend USING the tools! Instead, we jumped right into the real process skills and real science. 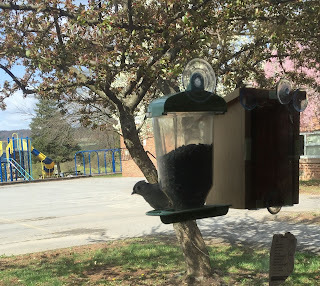 I have pages and pages of data from our bird feeder observations of the last few years. 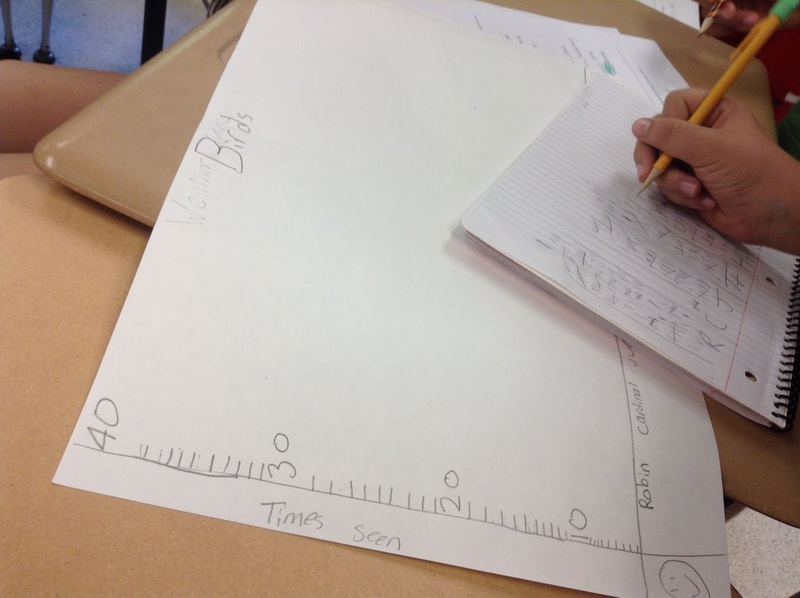 Fourth graders liked to keep the data, but never worked much with analyzing it. There are two kinds of lesson planning to me. 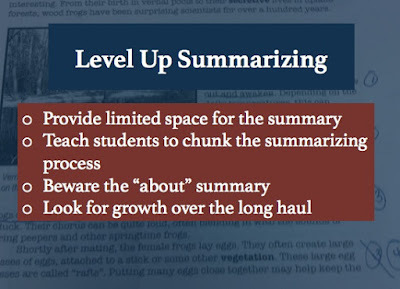 One kind is the clear, cut-and-dried lesson planning of curriculum designers: Teacher will do x, students will do y, a known quantity of learning will ensue. But my favorite kind of lesson planning is the fuzzy lesson planning. It's "fuzzy" not because of a lack of teacher preparation, but because of the multitude of possibility in student responses. I can't picture exactly how the lesson will turn out, but I bring all of my knowledge and experience in the lesson to bear. Kids wasted no time in looking at the observations, which was great to see. Because they had chosen their groups, I could make some social observations of my own, always good to start with at the beginning of the year! 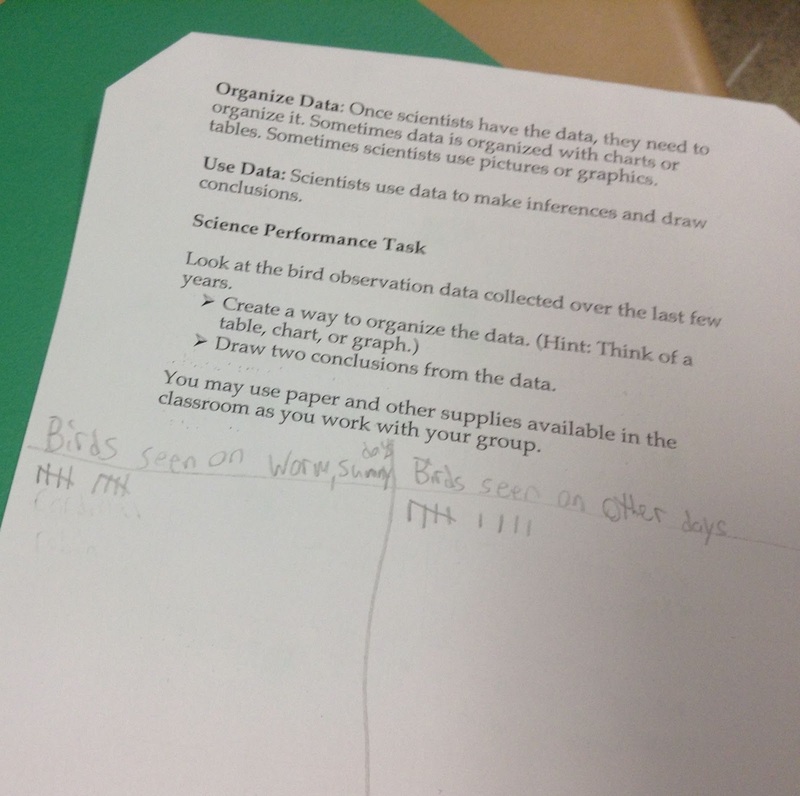 After they looked at the basics, students had to come up with a way to organize the data. This is a way that fourth graders and sixth graders are so different: The sixth graders jumped right into making tally charts. But what were they tallying? 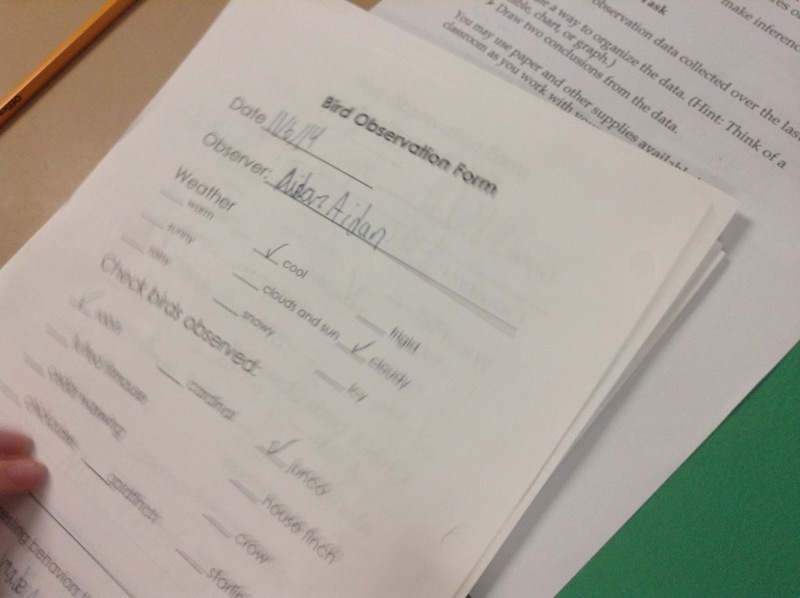 Data sheets included dates, kinds of birds, weather, student name, and behavior notes. What kinds of information would students tally? 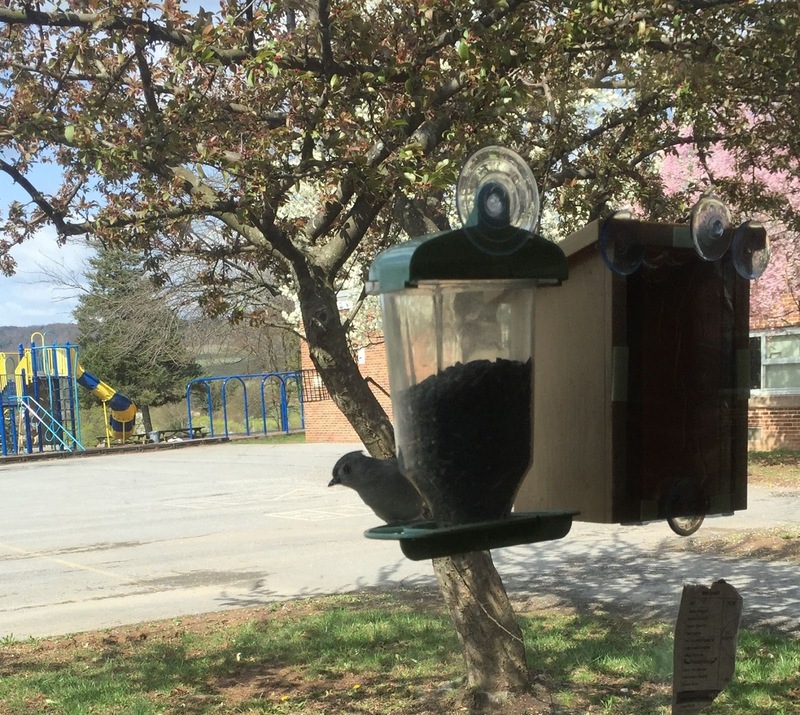 Luckily, it varied across the classes--just what I wanted to see! Many groups tried to find a link between weather and bird types seen. 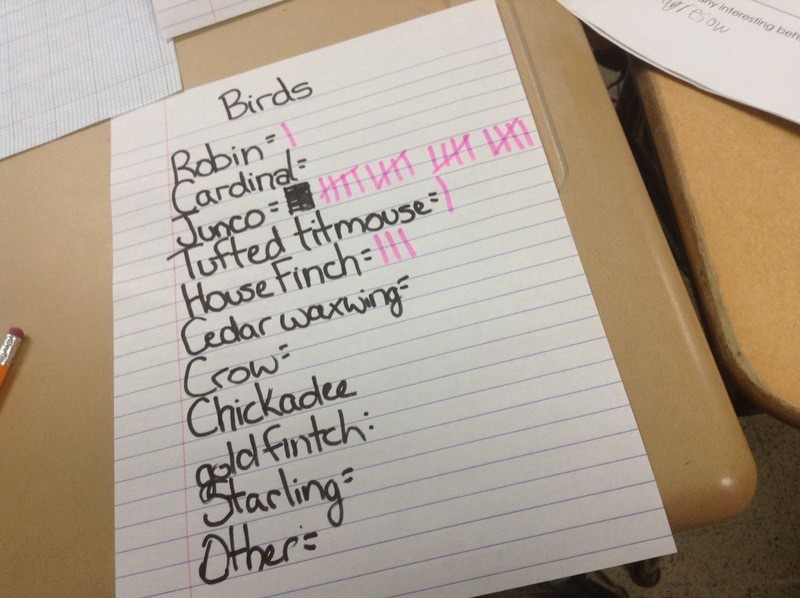 Some went for the simple "Number of birds seen"--a safe and productive choice. One group tallied data related to the student-observers, making a list of all of the students who had recorded observations and tallying how many times each name appeared. Knowing what to tally, and realizing that there are multiple possibilities, is a huge science process skill. And yet it is one that is never explored during those "Preparing for Science" units. The cooperation that I observed was also fascinating. 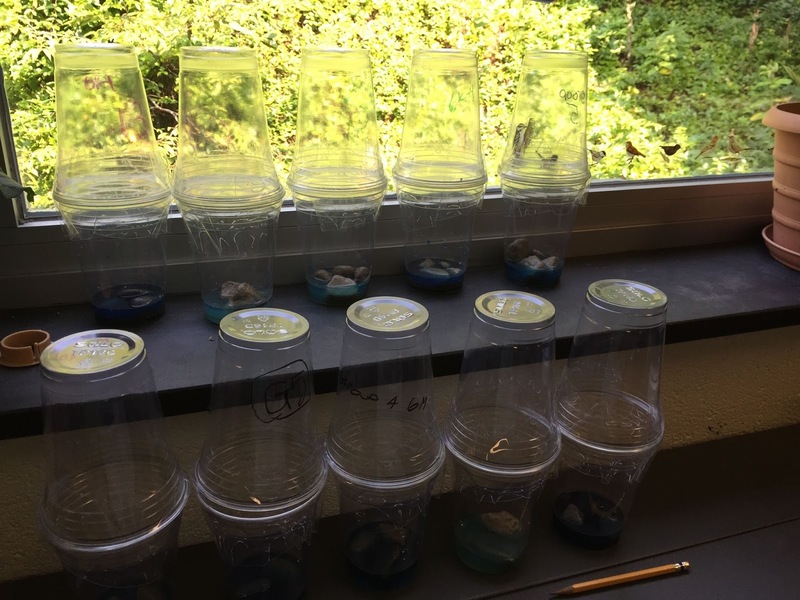 Students figured out that they needed to keep track of which papers they had tallied, and which they hadn't--and they also figured out ways to split up the workload to keep everyone engaged. Again, these aren't skills that usually show up in traditional science units! 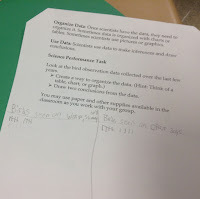 I told students that they could have access to any paper in the classroom to display their data. This got them up and moving and looking around for supplies! 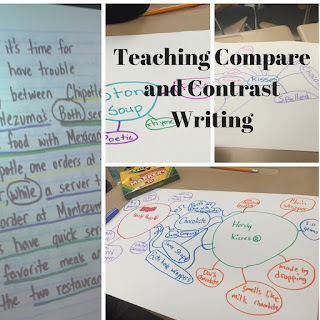 I loved watching how some groups used graph paper and others used construction paper. Some groups looked for rulers to make straight lines. 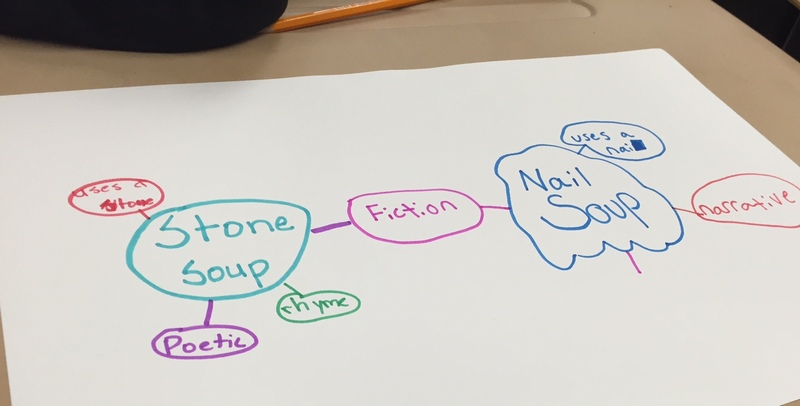 I helped a few groups to create graphs using the NCES Create a Graph site. 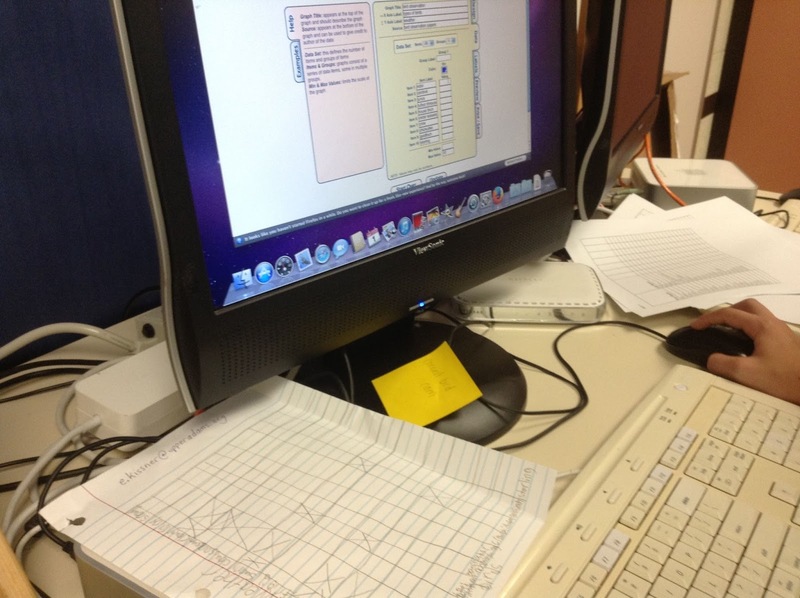 This site is one of the best for science instruction--instant graphs! Kids still have to do lots of thinking, though, and they worked together to create titles, figure out what to put on the x-axis and the y-axis, and work through the numbers. The question of incomplete data came up frequently. There were a lot of bird observation pages that just weren't finished--it was time for recess, we were leaving the room, etc. (Several of the unfinished pages were mine. Oops!) What is the effect of incomplete data? Kids were passionate as they complained about how "annoying" it was to see so many pages that didn't have everything filled out. I only hope that they remember this annoyance when they have data charts to complete this year! There was also the question of overlapping data. On the observation sheet, a recorder could check off weather conditions like "warm", "frigid", "cloudy", "cool", "sunny", and so forth. But some of these weather conditions could overlap--a day can be warm and cloudy, or frigid and sunny. The students who tried to link weather conditions to kinds of birds seen found this overlap frustrating and it really kept them from seeing clear patterns. This fuzzy lesson revealed a great deal to me about the students, and helped my plans for the upcoming year to come into focus. They showed some great cooperation working in groups, which reinforces my instinct to build in as many collaborative activities as possible. Once all of the charts are displayed in the hall, will kids notice this? Will they see that different groups came up with different information, and wonder why? What will I do if this happens? What will I do if this doesn't? I really hope that students will be able to come up with a new data collection tool. What learning can they take from this lesson to apply to future data collection? I've added a digital thermometer to the window...hopefully someone will pick up on this hint that we have to record the exact temperature! I was glad that I did this lesson, because it helped me to learn more about my students. A fuzzy lesson can be daunting to undertake, but the rewards can be far greater than any worksheet. I've been busy setting up my new classroom! Here are some of the things that I've learned and noticed through the process. First, I jumped off the cute train. 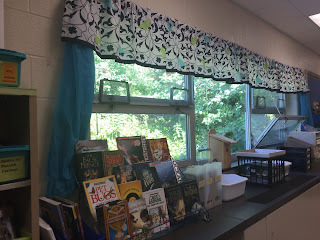 Teaching fourth grade for the last few years, I felt pressure to make a gorgeous and cute classroom that exemplified a theme. This year--I decided to free myself from this pressure. Instead, I put my energy into organizing books. I sorted all of my books and downsized quite a bit. (I gave my Horrible Harry and Fangbone books to my husband, who teaches third grade...his students will love them!) 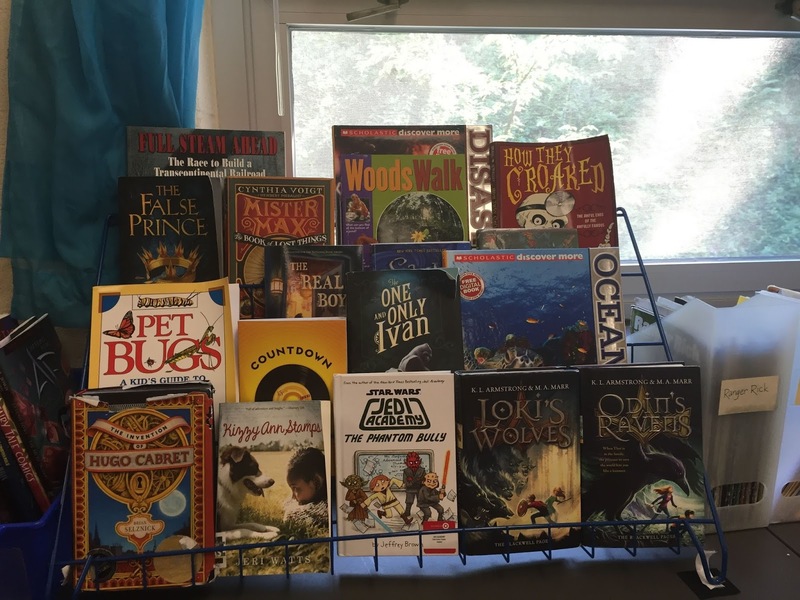 Because I've taught most of my incoming students before, I know what they like, and I wanted to have a classroom library that would impress them and be new and different at the same time. This is the group that loved Amulet a few years ago, so I made sure to have lots of graphic novels on display. 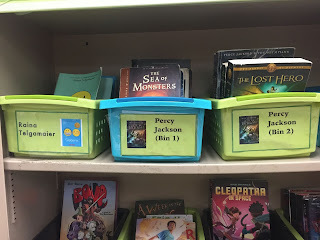 But I also want to show them more, so I pulled all of the Percy Jackson books from the shelves at home, as well as books by Andrew Clements, Gordon Korman, and Pseudonymous Bosch. 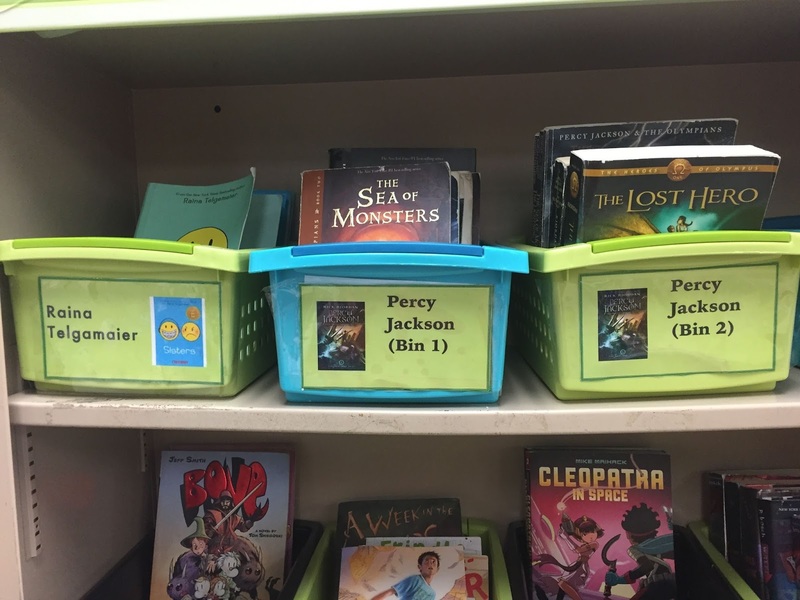 I've also added a bin for Nathan Hale's Hazardous Tales, Bunnicula books, and the I Survived Series. 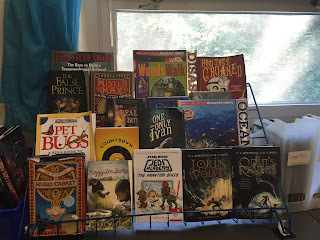 I love my large display for featured books. The collection here is somewhat random--I've put together the books that I bought over the summer. (Can you see that some of the covers are already curling? I hate the humidity!) I'm excited to share Countdown and Mister Max with students this year! My room is pretty basic, otherwise--and I really like it! After all, right outside my windows I have a gorgeous green bank, filled with milkweed, honeysuckle, and tulip poplar saplings. What glossy die-cut figures could compete with that? 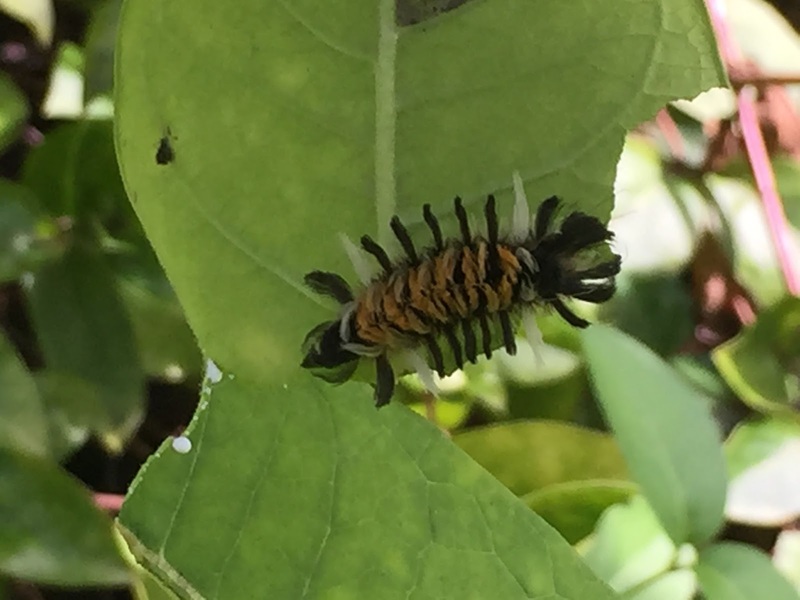 Just today my sons found a monarch caterpillar and a milkweed tussock caterpillar right outside. 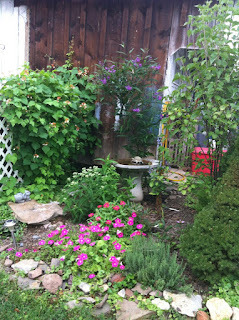 Once school starts, I'm going to put up birdfeeders to see what else we can entice! 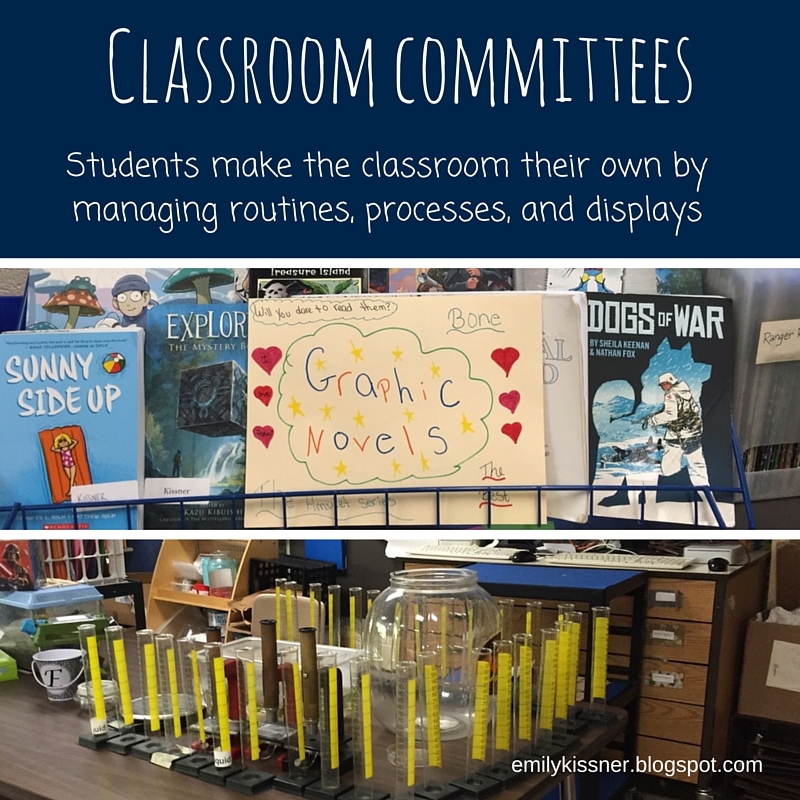 When I stepped away from the cuteness arms race and really thought about the classroom, I could spend more energy on the tasks that really matter. Now I have lots of empty space on the walls for the anchor charts, artwork, and displays that students create. 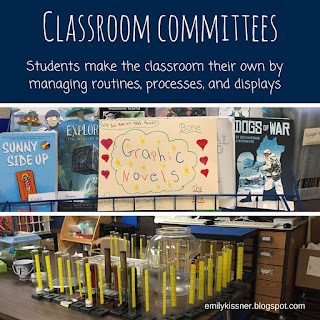 Students aren't coming into a museum room, but a workspace that they can impact and change. What better way to start the year? Over the course of three years I created monthly packets of reading homework. Each packet includes texts with vocabulary words, comprehension questions, and other activities. A cover sheet explains the week's assignments in a clear, parent-friendly way, and answer keys are included in the teaching guides. Even if you are not looking for homework, you can use these texts in other ways. Here is a month-by-month look at the texts. Ah, September...a month of getting used to new routines, new classmates, a new year! This month's homework packets introduce the routine and review different kinds of texts. 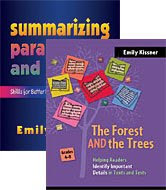 Each text includes comprehension questions, vocabulary practice, and a vocabulary quiz. The Great Bear: Legend of the Fall Sky: This short text includes a retelling of the story of the Great Bear. Kids love learning about constellations and sharing their summer stories! The Green Darner: This informational text tells about a migratory dragonfly, the green darner, in question-and-answer format. Caramel Apple Float: A kid-favorite, this procedural text tells how to make a fun autumn beverage. The Apple Harvest Fair: This persuasive text is an advertisement for a harvest fair. In October, the texts become longer. 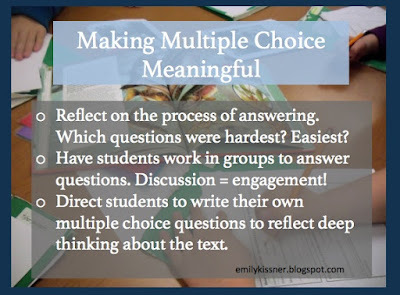 Open-ended responses are added as teaching options. If you use these, of course be sure to always make sure that students have access to the text as they are writing their responses. Pumpkins in the Past: This informational text explores how pumpkins have been used in the past. Pumpkin Seeds: This historical fiction story is a retelling of an American legend. I always end up using this to teach several aspects of narratives, and kids love acting it out! What's Up, Woolly Bear? : This is a hybrid text--informational text conveyed as a fictional interview with a woolly bear. It's a great text to use to discuss this kind of writing and the intersection of fact and fiction. Idioms, Adages, and Puns: Wordplay abounds when I use this text! Kids like being able to classify sayings as idioms, adages, and puns, and the lessons from this text last all year long. November is the month in which we really start to work with longer, more complex texts. Two fables are included in this packet, along with two informational texts. The Wolf and the Dog: This fable brings up some interesting questions among students. It is another good one to act out with the class and discuss in depth. Veterans Day: This informational text traces the roots of Veterans Day from Armistice Day. The Bell on the Cat: A second fable, this one is a nice companion to "The Wolf and the Dog". Voyage to a New World: This informational text outlines the voyage of the Pilgrims to America. 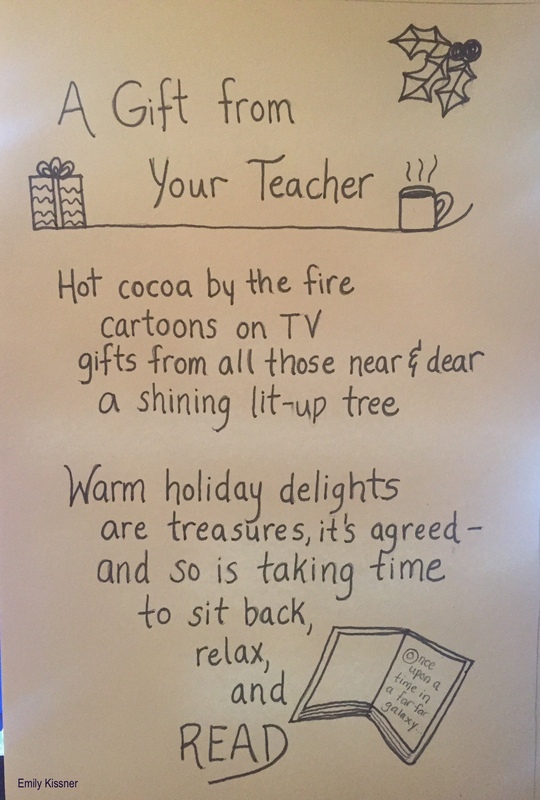 December includes only three texts, plus a choice menu for students to use over Winter Break. A "Focus on Complex Text" page is included with each text, forming the basis for a lesson helping students to look more closely at texts. Remembering Pearl Harbor: Kids who enjoy learning about World War 2 find this informational text especially interesting. Lighting the Tree: This drama takes place at the lighting of the first national Christmas tree in 1923. Snowflakes and Scissors: How do you make an origami snowflake? Devin learns how in this realistic fiction story! Winter Is: This poem shows a bit of a negative attitude toward winter. Students learn about speaker and speaker attitude in a poem. Blizzard Warning: This informational text describes the impact of the Blizzard of 1978 on Boston. Happy Australia Day: Kids enjoy this compare and contrast text that shows how Australia Day and Independence Day can be compared. Fairy Bread: Another procedural text, this simple recipe explains how to make the Australian food fairy bread. Do Polar Bears Eat Penguins? This text explains why polar bears are not predators of penguins. A good geography link! Theseus and the Minotaur: Kids love this retelling of the classic myth. Discover Antarctica: A fictional advertisement for an Antarctic cruise, this gets kids talking about whether they found the text convincing! Facing the Flu: An informational text about...the flu! Frog Poems: Two poems about frogs, excellent for students to compare. Point/Counterpoint: Two perspectives on Daylight Savings Time. This text is interesting for kids to read around the time that we "spring forward". The Vernal Equinox: This informational text explains the vernal equinox. A Stinky Sign of Spring: After we read this, kids have a new appreciation for skunk cabbages. I love these texts too...they are perfect for warmer days! Fishing: A free-verse poem about days of fishing. Migrating North at Winter's End: This informational text describes the different cues that birds use to head north at the end of the winter. What is Persuasive Text? This essay explains what persuasive text is. 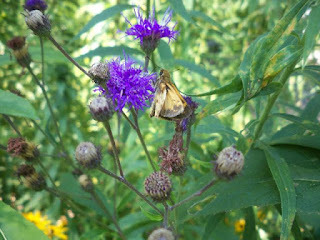 Interview with a Great Blue Heron: Kids loved the woolly bear interview so much that I created another one, this time about the great blue heron. The year ends with a set of four final texts. Cheetah Cubs in Zoos: In this problem/solution text, students learn about problems that cheetahs have faced, and how zoos have tried to solve them. Androcles and the Lion: This fable is a favorite for kids to act out and retell. 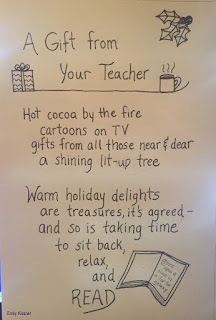 Some More S'mores, Please: A final procedural text, this makes a great end-of-year activity! Memorial Day: This four-part script explains the history of Memorial Day.